Ring News 24Boxing NewsGeorge Groves vs Chris Eubank Jr: What time is the fight, what TV channel is it on, who is on the undercard and can you still buy tickets? 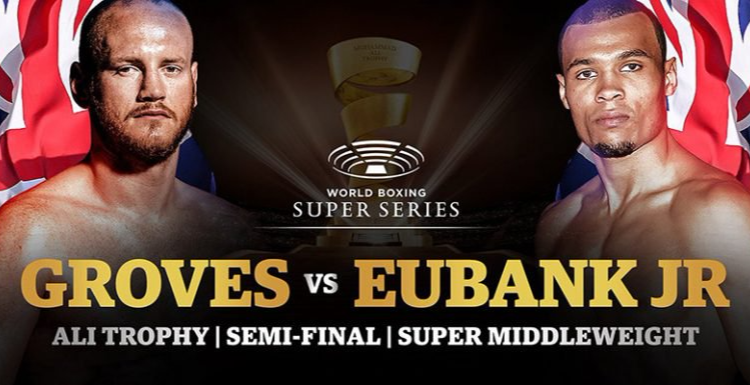 In one of the most anticipated fights of the year, we see George Groves take on Chris Eubank Jr in the World Boxing Super Series semi-final this Saturday night. When is Groves vs Eubank Jr, and what time does it start? Groves vs Eubank Jr will to be held this Saturday night, February 17. The fight will take place at the Manchester Arena, Manchester, UK. Ring walks are expected at 10pm. What channel is the Eubank vs Groves fight on? This fight will be shown live on ITV Box Office, ITV’s pay-per-view service, live from 10pm. The fight will cost UK viewers £16.95 while viewers in the Republic of Ireland will pay €19.95. How to buy Groves vs Eubank Jr pay-per-view? ITV holds the rights to the World Boxing Super Series and you can watch the action live through ITV Box office (PPV) and TVPlayer. Sky TV customers will only be able to buy the fight on their remote if they have already purchased a previous event through ITV Box Office. Otherwise an account will need to be set up online through itvboxoffice.com. To watch ITV Box Office at home on your Virgin Tivo or Virgin TV V6 box, you can order the event by pressing Home or On-Demand on the remote control and going to “On Demand” and then “Live Events” then press the red button. Customers will then need to choose the event, select “OK” and follow the on-screen instructions. Are there still tickets available for the fight? The venue is sold-out. However limited Groves-Eubank tickets are available on Stub Hub. Who will the winner face in the final? Callum Smith will face Germany’s Jurgen Brahmer in the semi-final on February 24th with the winner progressing to a final against Groves or Eubank Jr.
Will Chris Eubank Jr ditch his dad if he loses to George Groves?